PARI maintains multiple partnerships for its inhalation systems, under exclusive license agreements in various stages of development and product life cycle. Insmed Incorporated is a global biopharmaceutical company. ARIKAYCE (amikacin liposome inhalation suspension), Insmed’s first commercial product, was approved in the US in 2018 for the treatment of Mycobacterium avium complex (MAC) lung disease as part of a combination antibacterial drug regimen for adult patients with limited or no alternative treatment options. ARIKAYCE is the first and only FDA-approved treatment for this patient population. ARIKAYCE is administered via an eFlow® Technology nebuliser system called Lamira. Experts for the development of inhaled products founded Elevation Pharmaceuticals, Inc. The company focused on the development of a nebulised long acting muscarinic antagonist for the maintenance treatment of chronic obstructive pulmonary disease, including chronic bronchitis and/or emphysema delivered via a novel eFlow® Technology Closed System nebuliser. In 2012 Sunovion Pharmaceuticals Inc. acquired Elevation for up to $430 million and obtained approval for this drug-device combination, called Lonhala® Magnair®, by the FDA in December 2017. San Diego based Mpex Pharmaceuticals Inc. initiated the development of inhaled Levofloxacin for the management of chronic pulmonary infections due to Pseudomonas aeruginosa in adult patients with cystic fibrosis. Raptor Pharmaceuticals Inc. valued QUINSAIR with an upfront payment of $68 million, up to $34 million Raptor shares as well as contingent payments of up to $350 million. Inhaled Levofloxacin is sold under the brand name QUINSAIR in Europe and Canada since 2016 and is administered via an eFlow® Technology nebuliser called Zirela. Vantobra (Tobramycin 170 mg) is a development and proprietary drug product of PARI Pharma. It is indicated for the management of chronic pulmonary infections due to Pseudomonas aeruginosa in patients aged 6 years and older with cystic fibrosis (CF). 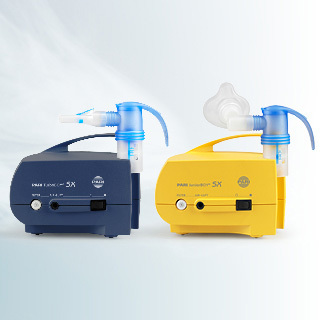 Vantobra is administered via an eFlow® nebuliser handset called Tolero and distributed in some EU countries by PARI owned subsidiaries or selected distribution partners. ColiFin / Colfinair (Colistimethate sodium for nebulisation) is a product of PARI Pharma. It is indicated for the management in adult and paediatric of chronic pulmonary infections due to Pseudomonas aeruginosa in patients with cystic fibrosis. The medicinal product is administered via an eFlow®rapid nebuliser handset. ColiFin / Colfinair provide the patient with the saline solution for reconstitution and a new nebuliser handset with each package. This specific drug and device concept is marketed in several countries in the EU and highly accepted providing a unique selling proposition in the treatment of chronic pulmonary infections. Lonhala® is a registered trademark of Sunovion Pharmaceuticals Inc.
SUNOVION is a registered trademark of Sumitomo Dainippon Pharma Co., Ltd. Sunovion Pharmaceuticals Inc. is a U.S. subsidiary of Sumitomo Dainippon Pharma Co., Ltd.